Let the mad rush and the festive excitement begin! For the near future I’m featuring humor with a twist of ridiculous on the blog-o-la. Enjoy a tongue and cheek look at the craziness of this special time of year as I share my battle plan of Stay-Sane-Tips for this Christmas. Let’s get ready. Get set. Get Christmas! Retail stores feed the gung-ho Christmas-before-Halloween fervor that has taken over our nation. Thanksgiving is barely a holiday on it’s own as more and more folks are overcome by the compulsion to decorate for Christmas as early as possible. The turkey is barely off the table before we are shooing our guests out the door and breaking out the decorations with glee. Can we talk about the decorating? 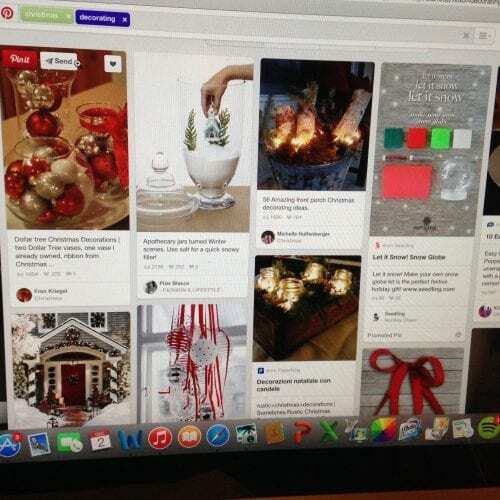 Journalists have noted a distinct run on Pintrest the day after Thanksgiving in the mad rush for new and better ideas for decorating for Christmas this year. As if we need to do more, bigger, and better…. I’m pretty sure we’re a bit over the top already. Pintrest executives had to work overtime to keep their servers from crashing with the increased traffic. With the popularity of smart phones, we can now do our Black Friday shopping and stay up to date with Pintrest, all the while posting our bargains and our decorating success on Facebook and Instagram! But in reality, what would Christmas be without the decorating? 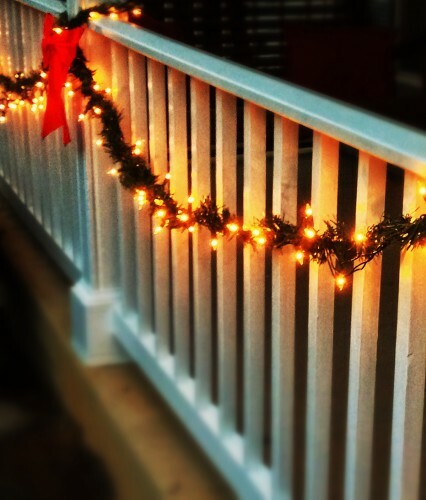 Nothing feels like home for the holiday’s like a house decked with lights and greenery. Don’t you just love putting up the lights and adding that festive ambiance to your electric bill for the month of December? 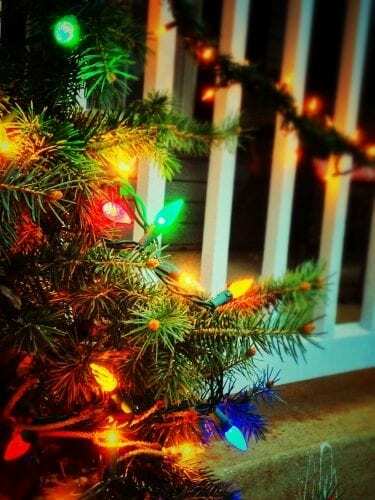 And isn’t it fun the way those strings of lights have a mind of their own, tangle up with the ends nowhere to be found? You risk life and limb to get them up on the top of your house. You turn them on, all ready to oohh and ahh, and nothing happens. Drat. Forgot to check for working lights before heading up to the roof. Unhang (is that a word?) the lights and head back down the ladder. You spend 15 minutes trying to find that one little bulb that won’t work. You shake it; you try to jiggle it back to life. Then you accidentally step on the last replacement bulb. Crunch and it’s another trip to Walmart for more lights. Let the men in your household take over light duty and stay as far away as possible. Conquering the lights satisfies that manly urge to slay deer and provide for the family. Staying out of the way ensures marital harmony while your man proves to the neighbors who has the biggest, baddest light display. Greenery is one of my favorite parts of Christmas decorating. This is where the man better get out of the way and let me put boughs of holly where ever my sweet little heart desires! Yes, we need garland there, and there…and there….! Even better is greenery with some sparkle to it–shiny gold ribbon or glittery garland adds a festive touch! 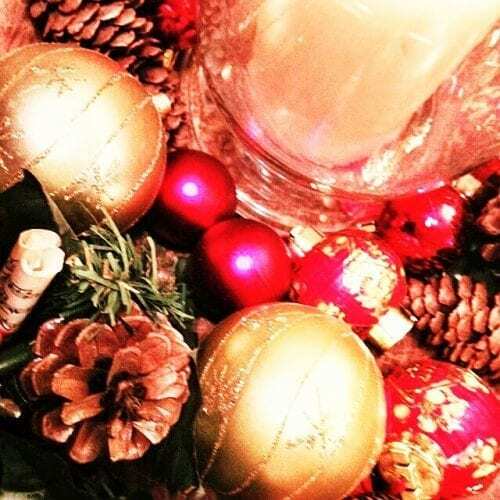 In fact, you just can’t have too much bling when it comes to Christmas decorating! <Tweet. Never underestimate the power of glitter. If you mess anything up, just use a little glitter. A little glitter will fix most anything. Late with the Christmas cards? Add a glitter sticker and all is forgiven. Break your favorite Christmas plate? A little glitter glue will fix it. 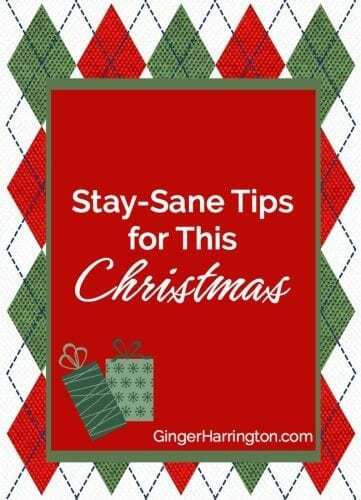 What’s your best Stay-Sane-This-Christmas Tip? Today I’m joining the community at Coffee for Your Heart, Faith and Fellowship, Family Fun Friday, and Fellowship Fridays. busyness, Decorating for Christmas, humor, Stay-Sane-This-Christmas Tips. Bookmark. Get Ready, Get Set…Get Christmas! Great post, love the ideas and tips. Have a blessed Christmas. You too, Terri! Thanks for visiting today. Thanks for stopping by today! Have a wonderful Christmas. Simple is good! Your comment love is such a sweet blessing! Ooh, me too. Decorating the tree is my favorite part! Thanks for stopping by today! I still get sad that I only have enough decor to decorate one room. I don’t go on Pinterest much this time of year, because I can get sucked into every else’s “what seems like” perfection and forget that mine is okay. I am thankful my hubby always takes care of the light and now that my kids are older, they take over much of the decoration. It’s fun to sit back and let them create. I don’t have much so they can’t mess it up too badly, and well, there’s always glitter! Gotta love the glitter! Yes it’s fun when everyone get’s involved. I really am a fan of candles and garland. True confessions, sometimes I leave it up until Feb because it doesn’t scream Christmas like santa statues or something! Love the fun you have added to Christmas! We are just excited we actually get to have a tree and maybe even lights on the house this year! We tend to be winter military movers and the years we get to put up decorations seem to be pretty sporadic. My sweet husband might just be overcome by the craziness of it in just this one year…you watch, he will take a tour to Afghanistan or something next year to get out of it. 🙂 We do love Christmas! Isn’t it crazy how you can get on a winter move schedule with the military! Yay for a tree and lights this year! Go all out and have a blast with your family!